Today is your half birthday! I hope you like celebrations, because I look for any excuse to have a party and half birthdays definitely count around here! This half year with you has only served to confirm how much our family has been blessed having you here with us. You are a smiley, laid back addition that every single one of us adore. At your check-up 2 weeks ago you were 17 1/2 lbs and 28" long. You are in 9-12 month clothes though I find you aren't a fan of clothes in general. You and winter coats may have an issue. But you and food do not have any issues at all! If it's edible you like it. This has made homemade baby food a breeze as you chow down on everything from baked apples to olive oil roasted carrots. You take two 3-4 hour naps a day and you had been sleeping a solid 12-13 hour nights, until this week. I'll blame the 6 month growth spurt for your 5AM parties and starvation protests. You are sitting up, rolling everywhere, and possess a growing motivation towards crawling since your big brothers torture you with amazing matchbox cars and army men within a few feet of your grasp. Wils, you have the best sunshine smile that melts anyone who catches it. You create joy all around you. You are so easy going and are always game to be snuggled in a sling or wrap for a hike, a shopping trip, or a day in the city. I love when your little fingers grab my face and pull me in for a kiss. I love the way you wrap onto my shoulder and bury your sweet face for a cuddle. I love your excited kicks when I come to get you from your crib. I love your pudgy rolls, your 2 tiny teeth, your fuzzy head of hair, and heart stopping baby blues. You have my heart. I am so blessed to be the momma chosen for you little man! 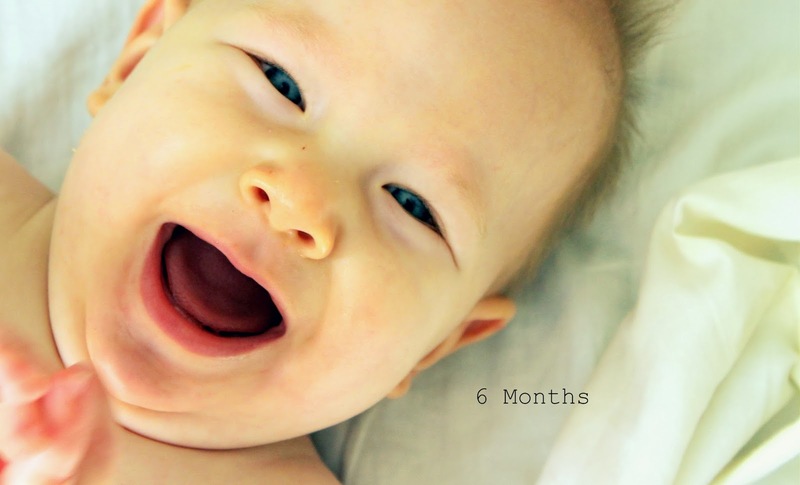 Happy 6 months my handsome Wils! We love you!